Abiel looked at me. We didn’t want him sitting next to us. He looked — and smelled, well, like a shepherd. But the inn was crowded for the Passover and Unleavened Bread season, and our law tells us to be hospitable to strangers, even if they are shepherds. So Abiel offered him a seat and a drink from our wine flask. Hebron was a hard 20-mile trip to the south, the place where Abraham buried his wife, Sarah, more than 1500 years ago. “Got here just before Passover,” Jonathan went on, “and the way this place is crawling with soldiers I can tell you I’m glad to be leaving.” He suddenly swore at the Romans and spat on the ground. Abiel and I exchanged glances. “If you were here for Passover, you must have felt the earthquake,” I said. “Well, that won’t bother me,” Jonathan said. “They don’t let the likes of me in there anyway. We’re not good enough for them.” He swore again, this time at the Pharisees and the temple guard. Typical of his kind, I thought — no manners. No wonder people don’t want shepherds around. “He was a good man,” Abiel said in low voice, glancing around the room. “And the Romans weren’t worried about him until the Pharisees and the elders and the chief priests brought charges of blasphemy against him.” Abiel looked at me, as if for permission to say more. “Tell me what?” Jonathan said. The shepherd looking meaningfully at our flask of wine. “This Jesus of yours — I think I know who he was. Let me tell you a strange story. Jonathan drank, then cradled his cup in both hands, staring into it. “It was back in the days of Herod,” he said. “The one they called the ‘Old Fox.’ I was just a young fellow then. Our family was poor. We made a living looking after the sheep of richer folk. We all laughed. 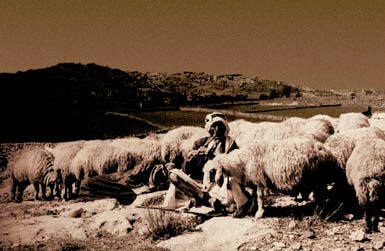 Shepherds had the reputation of being rogues. “Well, this particular night we got the sheep settled down and we were sitting round the fire. The older men were joking and telling stories. Abiel and I gestured impatiently for the shepherd to go on. “The Messiah!” Abiel said, his eyes wide. Again Jonathan nodded. 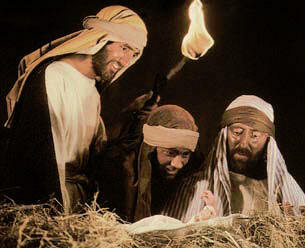 “The angel told us to go see this baby, who would be wrapped in swaddling cloths and lying in a manger in Bethlehem. Then the whole sky was full of angels singing, ‘Glory to God in the highest, and peace on earth to those he favors.’ Then, as suddenly as they appeared, they were gone. “We hurried to Bethlehem and found a man named Joseph and his wife Mary with their baby wrapped in swaddling cloths lying in a manger in the stable of an inn. The animals had been moved to one end, and one of the stalls had been cleaned out. Mary was young — no more than 15, I suppose. She was sitting on a pile of straw. It was all exactly like the angel had said. “My father told Joseph about the angel and how it told us to come see them. Joseph said they’d come to Bethlehem for the census, but there’d been no room for them at the inn. The baby was coming, so the owner let them use the stable. Joseph also told us how an angel had told Mary and later told him that she had been chosen to be the mother of the Messiah and that even though she was still a virgin, she would become pregnant with this special child from God. “Mary had been shocked, Joseph told us, because she had always been a very virtuous person. But she trusted God. Joseph looked at his wife and we could see the love and respect in his eyes. “So Jesus…” Abiel began, but Jonathan cut him off. Abiel and I must have looked startled. “Oh yes,” Jonathan said. “That old fox heard about the Messiah being born from some wise men from the East. They’d come to honor Jesus, but Herod’s reaction was to see him as a rival and try to kill him. One of my nephews was killed in that massacre. “But didn’t you say the body has vanished?” asked the shepherd. “What are you saying?” asked Abiel.